If you’re an avocado lover, you’ll enjoy this classic-dish-with-a-twist. 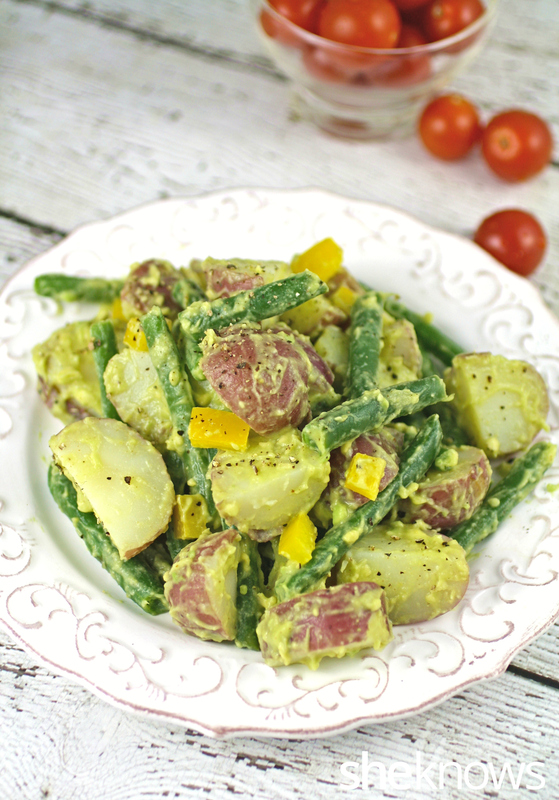 Whether you’re gearing up for a gathering or just looking for a fun side dish, this potato salad couldn’t get any creamier or more flavorful with avocado mixed in. You can’t have a picnic or springtime get-together without potato salad. This vegan version is flavorful and creamy thanks to avocado stepping in as a dressing. I mixed mashed avocado with lemon juice and a few other ingredients, then tossed it together with small red potatoes, green beans and bell pepper. 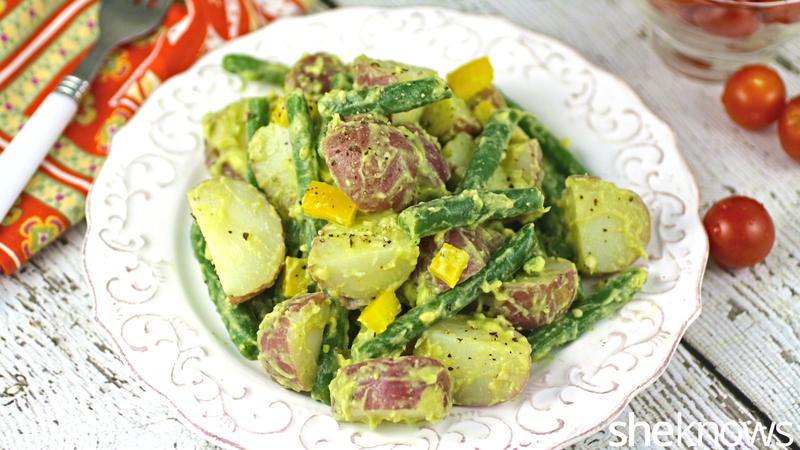 It makes a perfect potato salad that’s light yet creamy. You’ll enjoy this salad all season. Don’t stay stuck in a potato salad rut. 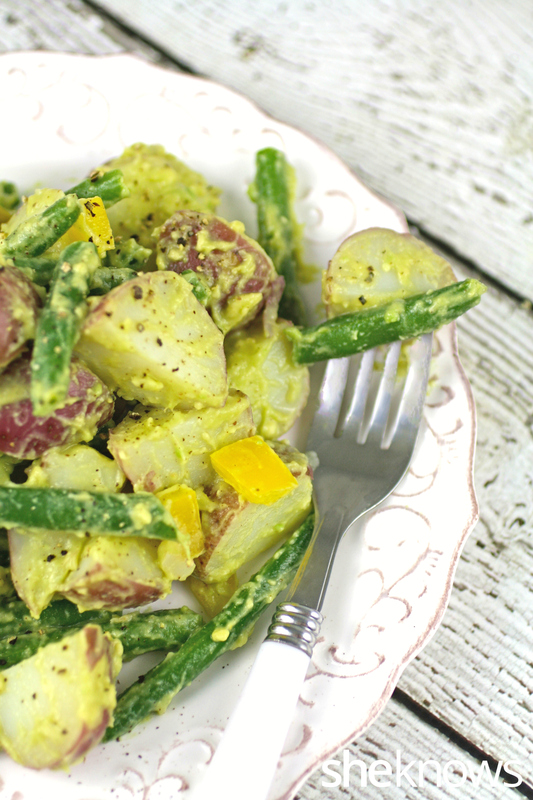 Avocado is so creamy on its own, and it makes the perfect match for potatoes and veggies. Try adding peas, celery or onions to this salad for another option. Add the potatoes to a pot of boiling water. Cook until fork tender, about 15 minutes. Add the green beans to the boiling water at the end of the cooking time, just for 30 to 45 seconds. Remove from the heat, drain, and add to a large bowl of ice water for a few minutes. Drain the water, and refrigerate until chilled, about 45 minutes. Remove from the refrigerator, and cut the potatoes into quarters, leaving the skins on. In a bowl, mash the avocado. Add the lemon juice, mustard, garlic and salt. Mix until smooth. Spoon the mixture over the potatoes and green beans. Add the bell pepper, and mix to combine. Season with the ground black pepper, and serve.